Boy! Oh boy! Oh boy! I am so excited about this month's SRC assignment. This month, I was finally assigned Sawson's blog, Chef in Disguise. I tell you, I have been a fan of this gorgeous blog for years now. Sawson is an "orthodontist by day and food explorer by night". I love that term, food explorer sounds so much more exotic than food blogger. And food explorer she is. If you go on over to Sawson's blog, you will be treated to a vast array of delicious recipes with beautiful pictures. Her blog mainly focuses on Middle Eastern cuisine, which I have enjoyed getting familiar with. Everything is so flavourful and there is so much variety. In addition to that she participates in the Daring Cooks and Daring Bakers Challenges as well. So you can expect a lot of recipes from other parts of the world too. I have had my eye on a couple of her recipes for ages now, but when I actually looked through her blog, there was so much more I wanted to try. With great difficulty, I narrowed it down to these spinach and feta mini rolls (I can't wait to try these), these awesome spiral meat pies called Yafawi Sfeeha, these Cheese and Zaatar sticks and cool off with this sweet tamarind drink, and for dessert how about this Harissa! I decided to go with the recipes I've been eyeing since forever - Sawson's Shish Tawook Chicken and this Middle Eastern Garlic sauce called Toum. Both were very easy to make and really delicious. The chicken was succulent and full of flavour and the garlic sauce was nice and garlicky with a nice tangy kick. My sauce turned out a little runny and I'd love to learn how to thicken it up a little more, but the flavour was all there. I made some wraps with Pita bread, finely cut Cos lettuce, sliced cherry tomatoes, finely sliced red onion and topped it with this gorgeous chicken and the garlic sauce. It was so very good. Thank you Sawson, for sharing these recipes. Cut the chicken breast into strips or pieces. Mix the rest of the ingredients together and marinade the chicken with it. Make sure all the pieces are well coated with the pieces. Cover with cling film and leave to marinade for atleast half an hour or in the fridge overnight. Drip off the excess marinade and grill or pan fry the chicken till done. On a medium low flame, cook the cornstarch solution till it thickens and starts to bubble, whisking continuously. Continue cooking for another two minutes. Take the solution off the heat and cool down completely. Place the cooled solution in a food processor or blender. Add the minced garlic, salt and lemon juice. Blitz till the mix starts turning white. Drizzle the oil in one spoon at a time, like you would for a mayonnaise till it thickens to the consistency of a mayonnaise. You may not need all of the oil. Serve immediately or refrigerate in an air tight container. ** My version wasn't as thick as I'd have liked it to be, but I hope to get that fixed soon. Sawsan does have a great blog. I got several recipes from it when I got her one month. This chicken dish sounds so intriguing. Great choice. I still have a few that I'm eager to try. It was so hard picking just one. I am sooo jealous of you... I've been reading her blog for years and I thought I was her number one fan, but I see I've got serious competition! What a nice recipe you picked, but let's be honest, ANYTHING from her blog is going to be outstanding, right? I love this!!! I'm thinking to work it into a salad..... Garlic sauce - Can't wait! 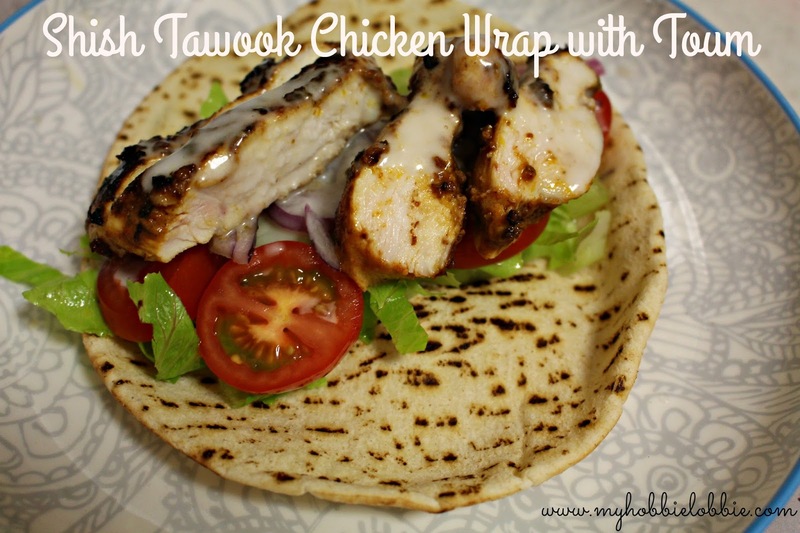 I made this chicken and sauce when I had Sawsan's blog, too! It's so good. I really, really need to make it again. :) It really is a fantastic recipe. Just give me a straw for that sauce, will ya? Great SRC choice! Trisha thank you so much for the kind words! I deeply appreciate them and I am really thrilled that you loved the recipes! You are very welcome Sawsan. It was a delight looking through your blog! Trisha - My mouth is watering from your description of Sawsan's many recipes. You picked a winner, but now I can't wait to be assigned her blog. Love what you did with her shish tawook chicken and toum. Thank you :) Oh you will have a blast with that assignment. It really is ... I hope u enjoy this as much as we did. Thanks for stopping by!